It takes a good wrestler to get over the fans, but it takes an amazing wrestler to have those fans riot for you on multiple occasions. 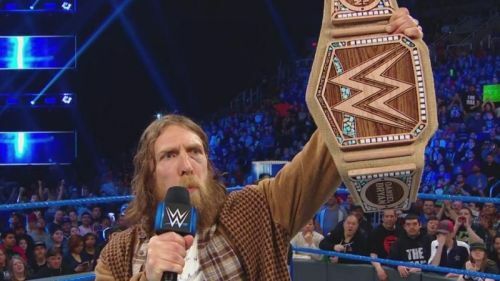 When Daniel Bryan announced his retirement in February 2016, it was an emotional moment for all WWE fans, and along with him, thousands of other fans retired from watching wrestling. Daniel Bryan was one of the few wrestlers who is loved and respected all over the world for his technical prowess. His mass appeal his incomparable, along with an undeniable good charisma. So, naturally, when WWE announced the return of the Yes Man on 20th March last year on their Twitter account, fans collectively rejoiced the moment and couldn't wait for their hero's return and pick from where he had left off. It has been more than a year since he returned, and what a year it has been. Let's recap how the year faired for the current WWE champion and what he achieved after returning. Daniel officially made his in-ring return at Wrestlemania 34 in a tag team match, with Shane McMahon tagging alongside him against Sami Zayn and Kevin Owens. The storyline was not all that impressive but it didn't matter as it made Daniel Bryan wrestle a match in over two years. The entire stadium was chanting "Yes! Yes! Yes!" and Bryan couldn't do anything wrong that day. Basically, he was the Becky Lynch of Wrestlemania 34. The return became more heartfelt as he made his return on the same stadium where he defied the odds and became the WWE Heavyweight Champion a couple of years ago at Wrestlemania 30, which later was popularized as the 'Miracle on the Bourbon Street'. Daniel Bryan was at his best throughout the match and it never seemed like he was out of practice. He hooked the Yes Lock onto Sami Zayn for the victory. He had a great returning match, but everything started going south from there.